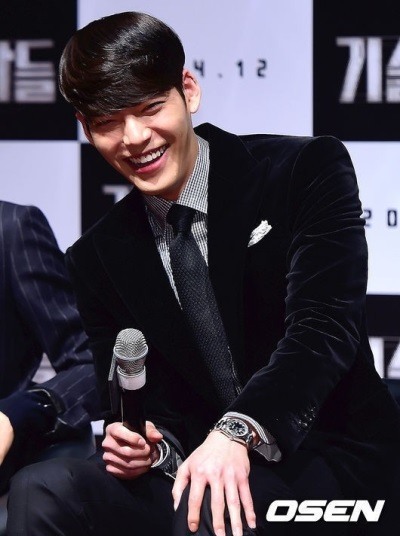 Model-turned-actor Kim Woo-bin had to refrain from his insatiable appetite for the shower scene in film “Criminal Designer,” the Korean heartthrob said in a press conference on Tuesday. The model-actor also recalled that, when he was in college, he and his friend once ate as much as 12 servings of Korean roast bacon and two bowls of cold noodle at a time. He complained that the filming crew ordered a late-night pizza when they were shooting Kim’s shower scene. “I could not eat as much pizza as I would usually have,” he said. “(After nibbling a small portion) I had to excuse myself to the director and have a quick 30-minute workout, right before entering the shower scene,” the actor added, driving the crowd into laughter. “Criminal Designer” is Kim Woo-bin’s first caper film, a genre with artful thieves as the lead roles. In the action film, Kim will play Ji-hyuk, the leader of a group of tech-savvy outlaws. His gang has only 40 minutes to steal 150 billion won ($140 million) from the safe of a state-run customhouse in the port city of Incheon. “Criminal Designer” is slated to launch in December.